Yesterday we began this little journey of examining results from a little survey I did last May. Review the previous post for more information on the survey. 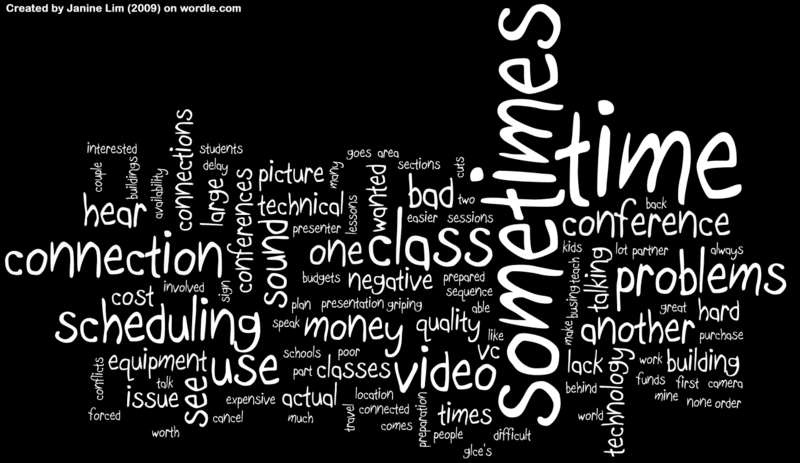 Please identify three to five negative things about using videoconferencing in your classroom. What words jump out at you this time? TIME! What ways are time challenging for videoconferencing? Scheduling and technical problems stand out in this list too. While these teachers tend to be in my schools with better bandwidth and infrastructure, they still have done enough VCs to run into glitches. I’ll share a couple full answers with you. This one is from Lacy Payne, F.C.Reed Middle School, in Bridgman, Michigan, (RUS grant school) whose students have done ASK programs, MysteryQuest, The Cleveland Museum of Art (to name a few), and has also participated in the Jazz workshop. I have a couple of experiences where I had to reschedule because of technology problems, scheduling problems sometimes occur, time availability, and cost. I have two sessions of classes I teach and in order to get them both in I have to have them at the same time which creates a large number of students upwards of 50-60 kids. If money wasn’t an issue it would be much easier to do one conference per class. 1) Preparation takes time out of other lessons I’ve planned, so I have to make sure I’m covering as many of the GLCE’s as I can. Editor’s note: GLCEs are Michigan’s Grade Level Content Expectations. 3) Hearing may be difficult due to the other classes’ facilities. And of course, this one is my favorite answer from a teacher who preferred to be anonymous in the survey results. I don’t consider any part to be a negative worth griping about. If forced to nit-pick, the time frame is sometimes out of classwork sequence. Are these negative things a barrier for these teachers? Read yesterday’s post! So, please comment – either with your own list of negative things about using VC in the classroom, or with your own interpretation of the data represented above, or your own ideas of how to address these challenges. I think using VC in classroom its an excellent way to engage the student’s interests into learning. I think the time prep would be the biggest factor, but the payoff might be better student learning. I agree, time zones might be challenging. Prep time might be a hindrance too. I do think students in my area would love it! Time is always a major factor when implementing anything in a classroom. This goes for IVC as well. I feel like it would be hard for me to use because of the size of my district. Money is tight. Time is also a factor.